Arvind's World: Increasing Insurance coverage - catch them young! insurance is our savings, social networks and kinship where we lean on others for assistance, the formal insurance means taking an insurance policy. The various segments where insurance cover is provided include life, health, personal accidents, fire and motor among others. 1.Insurance penetration – this means insurance premium as a percent of GDP. It is 4.1% in India last year and come has a long way from being around 2% in the year 2000 when the insurance sector got opened up in India. The world average in this regard is 3.1%. Given the saving habits of Indians and the younger age group bulge, it is however felt that India can reach a penetration level of 5.5-6% in next 5 years. 2. Sum assured as multiples of premium – this shows the intensity of insurance and shows, how much a person is willing to get a sum assured which is primarily determined by his capacity to pay the premium. The higher the sum assured, the higher will be the premium. 3. Level of protection in the country is also determined by the sum assured as a percent of GDP. 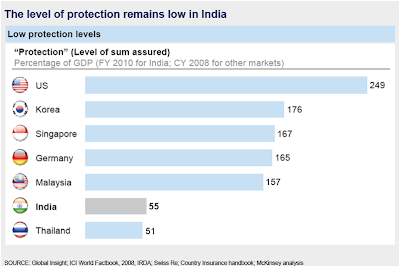 Higher the sum insured, higher is the level of protections in the country. This is discussed in detail below. The sum assured as a percent of premium collected shows, in a way, how people treat insurance products. On the one side of the spectrum is base policies providing life coverage at its minimum. The premium is low and the sum assured is low. An example is that of social security policies such as Aam Aadmi Bima Yojana and Janashree Bima Yojana. The premium is only Rs 200 pa and the maximum coverage is Rs 75000 in case of accidental death. On the other hand, we have life coverage which are in the multiples of millions and the premium also increases. 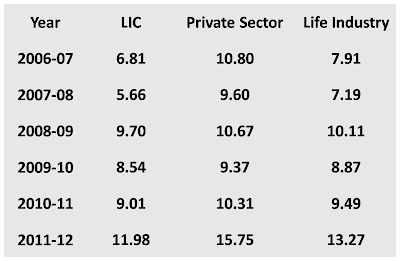 Lets look at sum assured as number of times of premium collected over the years..
LIC is obviously lower because it has social security policies. The sum assured as percent of premium collected is increasing, albeit slowly and it’s a sign of a maturing life market. 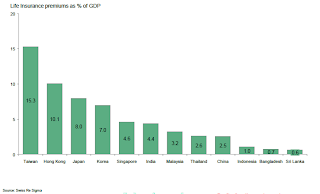 However, the sum assured as a percent of GDP in India is only 55% ( sum assured can cover only 55% of the GDP) whereas the world’s average is about 150% and some of the mature countries have more than 200%. In that sense, we have a long way to go to improve per policy sum assured. While penetration (insurance premium as percent of GDP) at 4.1% looks healthy, it can be increased. 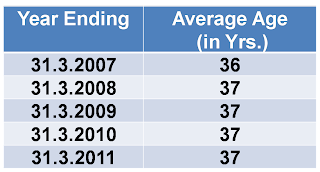 The saving habits in India, despite being decelerated a bit in recent past is still at a healthy 32% of GDP. What is worrisome however, is the fact that most of it is being invested in gold and real estate and the extent of household savings in insurance is only 17%. This needs to be improved and a conscious effort needs to be made to channelize people's savings into Insurace. 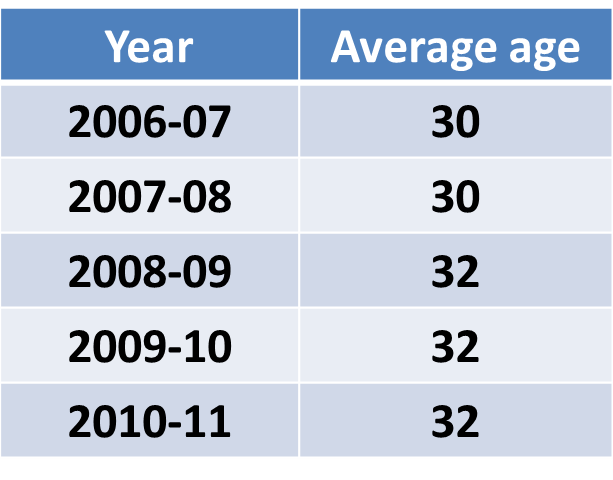 One way to improve sum assured (and insurance penetration) is to concentrate on younger generation. They will have a longer contributory span (a life policy of 25 years old versus 45 years old). Let’s look at what’s happening in LIC. The average age of LIC’s policyholders is: This average age of 37 years is not very high considering that life insurance is a long term contract and the average in respect of in-force policies for a grown up and matu red company like LIC, is bound to increase.However, the average age of LIC’s policyholders (risk weighted Sum Assured) in respect of New Business for the last five years is also worked out as and shown in the right side table. 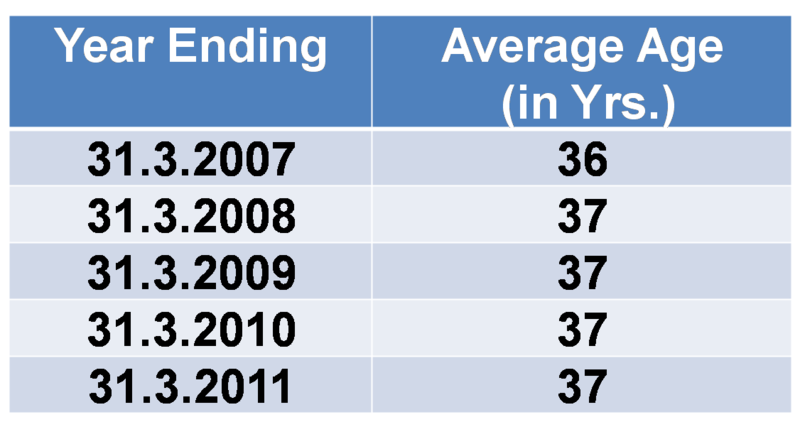 It is clear from the data that the average age of new business policyholder is not high and showing stagnation from last 3 years. Increase in New business average risk weighted age during last 5 years from 30 to 32 may be attributed to the higher saving capacity among older people. 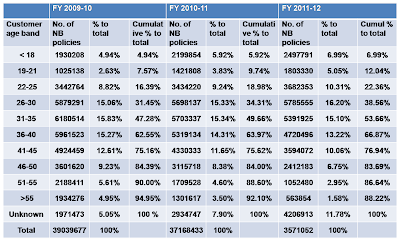 Following data which shows the NB policies sold for the last 3 years (not risk weighted) gives us some more insights: The table conveys that selling of new policies to the people below aged 35 years is constantly increasing from 47.28% of the total policies sold by LIC in 2009-10 to 53.66% in FY 2011-12. At present LIC is selling more than half of the policies to the people aged 35 years and below, which is a good indicator of the efforts taken by the corporation to be relevant for the young generation in changing business environment. 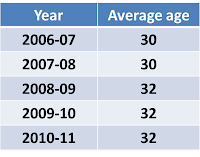 India has a demographic advantage with >50% of people in less than 30 age group. With increasing awareness about the insurance, the need to have an insurance cover is increasing. The average age of starting a job in India is between 23-25 years and it is here that we need to concentrate and have them insurance cover at the earliest. Its a win win situation as they get an insurance cover with a lower premium (because of their age, health profile being better) and the levels of protection improves in the country.